The fit for me line from Fruit of the Loom is all about comfortable, colorful plus-size active wear that never skimp on style, and helps you be your healthiest, strongest self. 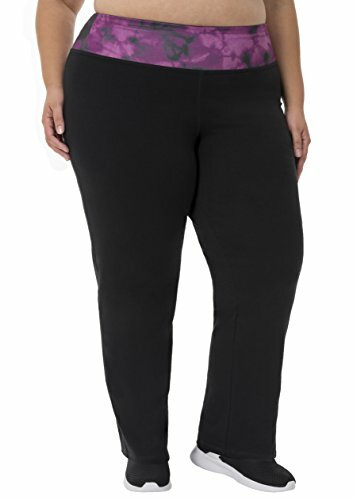 These relaxed fit yoga pants are perfect for a yoga workout, but they're so versatile, you can wear them anywhere - whether you're running errands, hanging out, or just want to look great while out on the go. The stretchy, cotton/spandex jersey blend has a straight-leg opening that combines form and function for a stylish, comfortable fit, and a hidden elastic, tag free waist band moves with you, keeping the pants in place, no matter where you're going next. Coordinating pieces are also available - check out the complete fit for me line for more fun pieces that you can wear anywhere you go. Machine washable; 95 percent polyester, 5 percent spandex. Fit for me works hard to provide true comfort and fit for every woman - it's made for curves. We're part of the Fruit of the Loom family, which makes colorful, smile-inducing, clothes with fits that won't quit - and they're wallet-friendly, too. From hipsters to hoodies, boxers to bras, and sleepwear to socks, our clothes are made so you can grab the world by the waistband and start your day happy. If you have any questions about this product by Fit for Me by Fruit of the Loom, contact us by completing and submitting the form below. If you are looking for a specif part number, please include it with your message.